Over the years the Abingdon Motors workshop has seen many rare and historical car restorations, and a number of unique custom builds. As the new owners, finding a shop project that would be worthy of Abingdon’s heritage was always going to be a difficult task. 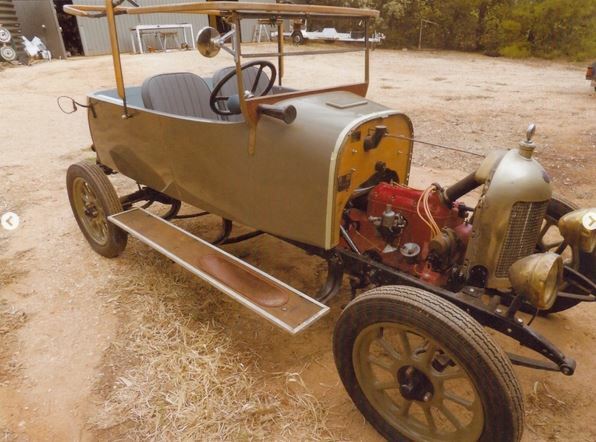 The decision was made to buy the car and build a replica of Cecil Kimber’s Old Number One. But this is not to be just any replica, our intention is to build it as faithfully as possible to its original specification. The car will be built as it was when it competed in the 1925 Lands End Trial, and we plan take it to the UK in 2025 to compete in the Trial on the 100th year anniversary. 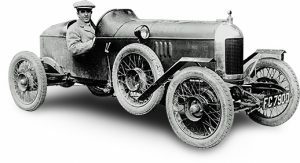 There are only three photos of the car in its original specification, and these are obviously black and white images with low resolution, so much of the detail needed has come from articles, and firsthand accounts from the time. After months of research, and a “quick trip” by David Wands to the British Heritage Museum to see the original car, we now have enough information that the search and the purchasing of parts has begun. Based on the published account of Mr C Martin, an employee at the Morris Garages in 1924, we know that the engine and chassis for the car were being worked on in March 1924. Similarly we are starting our build in the same way with Project #1, now stripped to a rolling chassis, and a replacement engine en route from France. 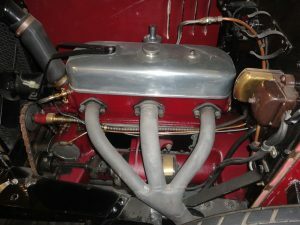 The standard Morris Cowley side valve engine was replaced in the original car, with a Hotchkiss overhead valve unit, of which there was approx 200 made for the short lived Gilchrist Cars (1920-23). It would appear the engine was a lucky find by Kimber whilst he was touring the Hotchkiss factory, after it was bought out by Morris. Certainly the chances of us finding one of those engines now would be nearly impossible. Therefore we have opted for a 1920’s Hotchkiss AM2 engine. This has the closest matching configuration to that used in Old Number One, and we may look into the viability of having the cylinder head re-manufactured to match that of the one used in 1925. That way its overall look will be the same, although it will increased horse power, which will be handy in 2025. 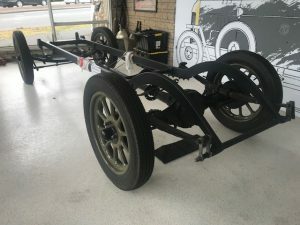 A standard Morris Cowley chassis was used, but modified to include swept arches over the rear axle, to allow for the car to be lowered. We also know that days before the start of the Lands End Trial, the chassis cracked behind the rear engine mount, and needed urgent repairs. Our intention is to have our chassis rails modified to match, with the inclusion of the plates used to repair the cracked frame. The plates would not only be aesthetically accurate, but would also strengthen a known stress point in the Chassis which clearly existed in 1925, and would only be more fragile 93 years on. The most controversial part of the build will definitely be the colour. There are several replicas in the world today, and to our knowledge, all have been painted red to match the car in its current configuration. However we do know that in 1925 the car was painted only in grey undercoat, which was standard for Morris Garage prototype cars at the time. It was only when the car was restored decades later that the current red colour was applied, as the car was to be used by the MG Car Company for marketing. True to its 1925 heritage, the Abingdon Motors replica will be painted in a matte finish grey paint to replicate the undercoat originally used. It will also be sporting the MG octagon on the passenger side, as captured in one of the three original photos, a detail unfortunately now missing on the original car. We will be updating the progress of the car with future articles, as we progress, and invite anyone who wishes to view the car to stop by Abingdon at any time. 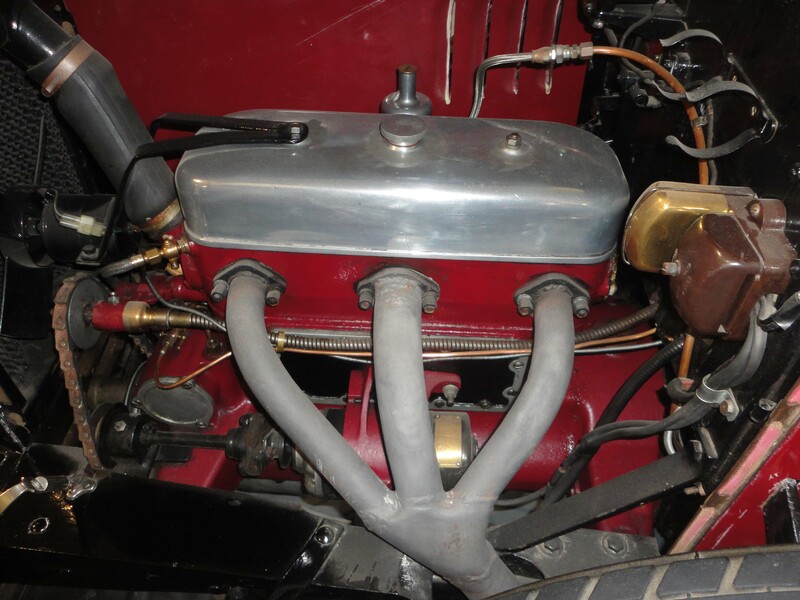 Since part one of this article, we have spent most of our time researching, hunting and sourcing original parts for the car, which the Morris Garage team would have used in 1924-25. Hence the long delay in bringing part two of the story to you. True to our original plan, we have now started the physical work on the car with the chassis modifications being carried out, and the plan for the engine is being formulated as I write this article. Over the past few months our search for 1924/25 Morris brake and suspension parts has lead us down a road of both frustration and surprise. With the invaluable help of Col Schiller, we have been able to acquire all the components to build the front suspension assembly, including the 12” brake drums. These parts are currently being cleaned and restored, and where 90+ years have taken their toll, we are having the parts re-manufactured using the original part as a reference. The UK members of the Early MG Society have also been an enormous help to us with information, photos and schematics graciously provided by Chris Keevill. Chris has patiently endured my barrage of emails and helped us greatly in our pursuit of accuracy. Also Chris & Robin Cooke who graciously escorted a new crown wheel & pinion from the UK to Australia, to ensure it arrived here safely. Only to have our own Australia Post lose it, after Chris posted it from Melbourne. It now has been found, but that was a week of stress that none of us needed. Following Dave’s visit to the BHMT museum in Sept last year, Rob, our Chief Mechanic visited the museum in April and was granted full access to the original car to take measurements of the chassis, and take detailed photos to assist us with our build. Armed with this information, our Cowley chassis has now been completely stripped down, and has been taken to Rust Ratz in Yatala to be modified to include the arches over the rear axle. As is well known, the chassis on the original car cracked behind the engine mounts the night before the 1925 Lands End Trial. The Morris Garage team worked all night to successfully repair the damage so the car was ready to compete the next morning. 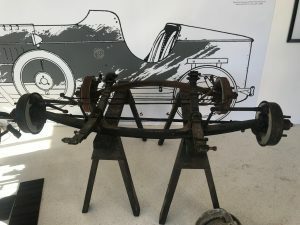 The cleats fitted to the chassis still exist on the original car today, and therefore we are opting to include them and those strengthening the joins to the rear arches, on our chassis. 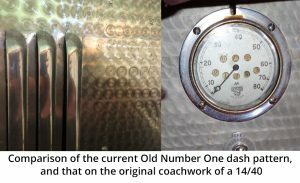 This is not only for accuracy, but given we have seen this repair on another Cowley chassis, currently in the Schiller stable, this was clearly a weak point in 1925 and therefore much weaker 90 years on. We expect the chassis to return in the next few weeks where we will begin the assembly of the suspension and brake assembly, and we hope to have the rolling chassis complete by our next Noggin’ & Natter in June this year. We have not been so lucky with the AM2 Hotchkiss engine however. Once it arrived from France, it was obvious that it was larger than what we were lead to believe. Although it looked the part, it would not be suitable, and as such we are now the proud owners of a very large and costly French paper weight. Undaunted, we are now working on our new plan which we believe will result in a much more accurate engine. Although the Morris Cowley has a side valve engine, the block itself is very similar in size and design to the Old Number One Hotchkiss block. Therefore, if we were able to convert the engine to an over head valve configuration, with a head that resembled that fitted to Old Number One, the completed engine would look remarkably similar and well proportioned to the Hotchkiss. There were OHV conversion heads made previously, however few have survived and rarely do any of these come up for sale. Luckily, again with a little help from our friends, we have been given access to one of the original LAP designed conversion heads. From this we can take all the vital specifications, so that we can design and create a new OHV head, with the outward appearance of the original Hotchkiss. The prototyping of this will begin in this month, with the hope that we have a viable head cast by July or August this year, and undoubtedly this process will be shared in our next installment. For those of you who have visited the shop in the past few months, you would have seen that the Cowley chassis has now been modified, and now sports the distinctive arches over the rear axles. We have been able to source the vast majority of the suspension parts needed, which has allowed us to begin mocking up the suspension on the chassis. Whilst this has been taking place, we are moving forward on the overhead valve cylinder design and manufacture, and plan to have a test cast completed in early 201 9. We are now in a position that we always knew would be inevitable; determining what the physical features, and parts were fitted to the car. The museum archivist has informed us that there is no written documentation from the factory that has survived. All we can rely on is the car itself, which there in itself creates another dilemma. The car’s history between 1925 and the 1950s is sketchy at best. It has been documented that the car was “seriously damaged” in a road accident, on 12th December 1932. It then disappeared only to re-emerge in the 1950s with the new registration number of “FMO824”. Obviously in that time the car would have been repaired and restored to its current configuration. However, it begs the question what, if any, of the original car remains? But this will be a discussion for another time. We have been researching the car now for just on 18 months, including 2 trips to the UK by Abingdon staff. As I write this, Colleen is packing our bags, as we are leaving in a week for a third trip to the museum for some final measurements, prior to commencing the coach work design. Fact - What we definitely know to be true and correct (based on photographic evidence of the car). Probability - What we believe would be most likely fitted to the car given its age and what was available at the time (such as instrumentation and engine ancillaries). Speculation – What we believe will never be known unless further information is discovered (such as trim colour and cockpit design). We know the car was fitted with Morris Oxford 12” brakes. Regardless of them not being fitted to the car today, and therefore we have fitted them to ours. 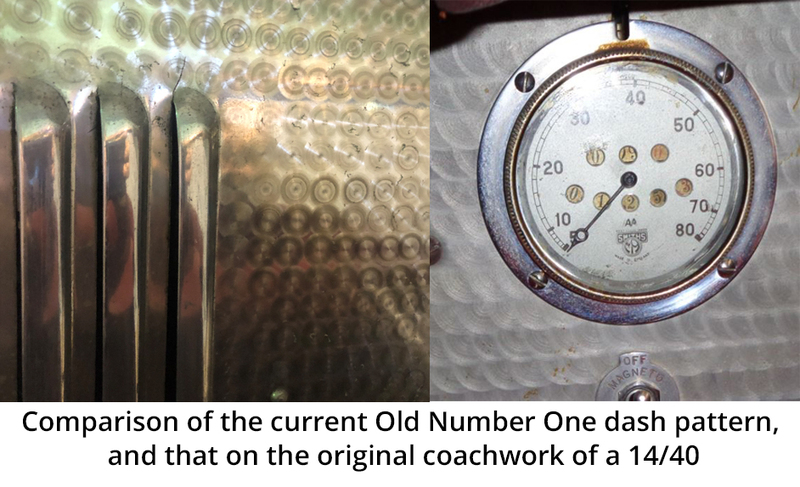 We can speculate that the car was fitted with a pattern aluminium dashboard, however we do not believe that the pattern on the current dashboard of Old Number One is correct. We base this assumption on the irregular ¾” circular pattern, on the aluminium body work of the 14/28 and the 14/40 MG’s being produced in the 1920s. We can presume that this was the aluminium that was used, not the uniformed overlapping larger circles that are seen on Old Number One today. To recreate the ¾” pattern we have designed and built a specialised jig that we will be using to fabricate the aluminium that we need. 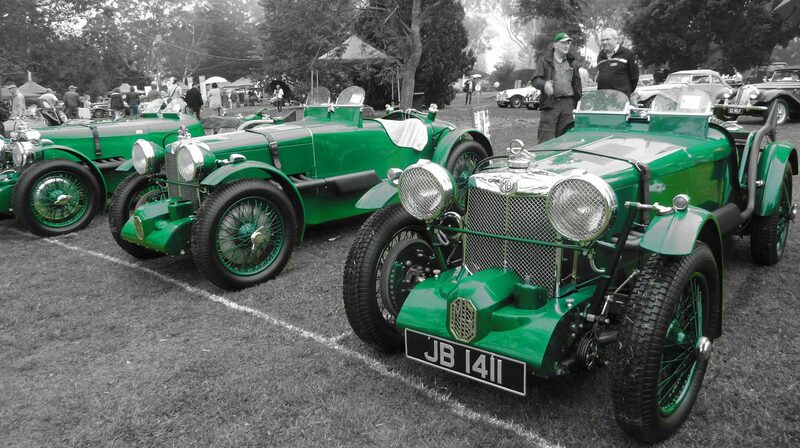 Given that we have no colour photos of the car from 1925, and the chances of any appearing are next to none, we can only presume the exact colour scheme of the car. Prototype cars of the day were not painted and were left in a flat grey undercoat. Although the exact shade of grey in not known, there is a reference to the car in a magazine article from the period, which refers to the car as being “dark grey”. But, it gives no reference to the colour of the seats, the wheels or the engine. This leaves us with the dubious task of determining what those colours may have been. The wheels were certainly not silver as they are today. The photo evidence clearly shows them as a dark colour and at this stage we are presuming that they are black, but for all we know, they may have grabbed a set of British Racing Green wheels that were discarded in the factory at the time. And before the next installment, I’ll leave you with this thought. What colour was the engine? The current engine is red. There are other post war photos showing the engine to be a darker colour, possibly black. In the 1920s MG was supplied with stock engines from Morris which were dark blue, but after their heads were removed and worked by the Morris Garage, the heads were then painted black and refitted to the blue blocks (possibly because they didn’t have any blue paint to match). 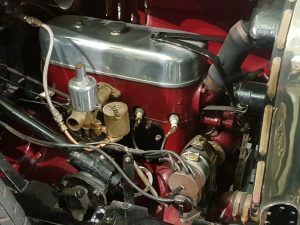 But then we need to remember that this is not a Morris motor, this is a Hotchkiss OHV engine, so what colour did they paint their engines when they were fitted to the Gilchrist cars? The next installment to this will be post our 3rd visit to the museum and we hope to have some interesting info and photos to share. PS: What colour are those seats, red, black, duck egg blue, ………?